Chinese singer, Na Ying (那英) was one of the many performers at the 2013 CCTV Spring Festival Gala held in Beijing, China on February 9, 2013. The singer was seen wearing a beaded embroidered coat-dress from Balmain Fall/Winter 2012 when she was backstage. Her look was completed with a black sheer blouse, grey denim and Giuseppe Zanotti sneakers. During her performance, she wore a white crisp ensemble from Givenchy Fall/Winter 2012 collection. Her look was completed with the same pair of sandals seen on the runway. 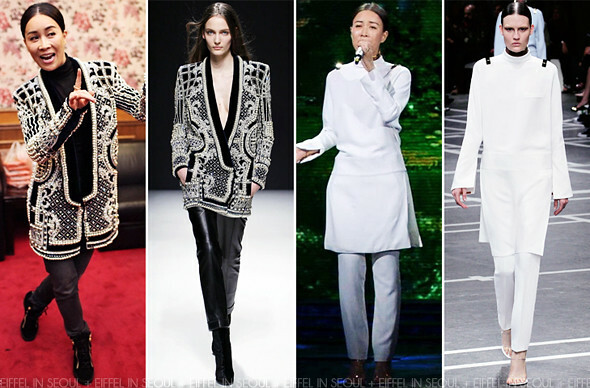 It's always interesting seeing how Na Ying (那英) dressed in labels like Balmain and Givenchy and pulling them off. I'm on the fence about her Givenchy look but she's looking great in Balmain.